B.L. Acoustics offers a range of Fire Telephone Systems, either standalone or as an integral part of a PAVA or fire alarm installation. These are fully monitored for all critical components and paths and independently powered for life safety. They can be tailored to the particular specifications of the complete emergency communications system, typically for use in a multi area building under a fire situation. 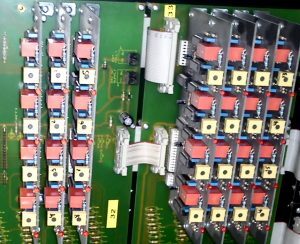 We provide exchange control units that satisfy to BS5839 and BS5588 standards with simple central controls. The field operations are automatic, with calls registered by the lifting of the handset. Cabinets with clear labeling provide protection and awareness. At the central panel, operations are automatic with manual latching connections and provide both audible and visual indications of all states within the system and are completely independent from all other systems and networks. A fire telephone system is essentially powered from a DC source derived from a mains power supply with full battery support. All power supply conditions are continuously monitored, including active monitoring of the state of the standby batteries. Plug in cards can be cascaded to allow easy system expansion. The central control unit consists of a master telephone and control switches for each line. This is connected to the main central control enclosure containing the line interface circuitry, all audio and system control circuits and power supplies. Each remote unit contains a monitored telephone mounted in a fire resilient wall mounting cabinet and is connected via a plug-in “B.T.” type plug and socket. Once the handset is lifted a call to the central controller is automatically made. If you want to know more about Fire Telephone Systems or if you would like a no obligation quote, please contact us.